To help you choose the Respro® product that best suits your needs. Respro® will ship your order to anywhere on the planet free of charge. What is the best mask for performance cycling where I’ll want to maintain the most beeathability and airflow? The best configuration for running/cycling in polluted cities would be the Respro® Ultralight mask with a Cinqro Urban filter. You could try the Ultralight Combo pack which includes the Ultralight mask and a pack of Cinqro urban filters. The Ultralight mask shell is made from air permeable material which is good for facial ventilation, has the Elite Powa valves for humidity control in the mask and by substituting the Cinqro Urban filter you get both sub micron particle filtration together with gas and vapour filtration providing overall a broader spectrum of screening from vehicle pollution. So, the Ultralight is the way to go, whether as a stand alone product or as a combination product. Ultralight Combo pack available is a significant saving over the two items if purchased independently. Hi. I live in Shanghai China, I need a mask for the heavy pollution here, also I like to run and cycle outdoors so it needs to be both for daily use getting to work etc and working out. Which one will be best fit for me? Also size. 24yo female. The pollution has everything, from PM2.5, PM10,etc. Any of the following masks which come with a combination filter would be suitable for exhaust pollution (VOC’s and PM 2.5’s) airborne viral and bacterial matter, cigarette smoke and active in urban sports. A combination filter has both a Hepa-type filter layer and a DACC layer. This combination of Hepa-type filter layer and DACC in one single filter provides sub micron (smaller than PM 2.5) dust filtering capability, together with DACC capability for filtering gases (VOC’s /Acid gases) and vapours . It is the best type of filter available in our range for dealing with the broad spectrum of vehicle and non vehicular pollutants commonly found in major cities across the globe. The usable lifespan of the Combination filter is based on the characteristics of the active urban cyclist. If you are using the mask for another activity it still applies, but your breathing rate and activity would put the lifespan of the filter at a proportionally shorter or longer time. If your breathing rate is say half that of a cyclist then the effectiveness of the filter would be twice as long. For cycle commuting on a daily basis we recommend that the filter should be replaced every month or every 69 hours, whichever is sooner. You will find the correct information and how to provide it below for us to confirm your sizing. If we have advised you of the size for your mask and it is subsequently found to be an incorrect size, then we will exchange the mask. Take a piece of string and place it between the eyes on the top of the nose bridge, run the string over the tip of your nose and down to just under the chin. This is the eye to chin length. Please note the curved line and the point to point distance. If you are in doubt then a Passport image would also be useful. I am not sure which mask I have to buy and I need some help please. I need it for cycling and my city is very polluted so i was thinking of buying CINQRO which best suits my needs but I noticed that is only suitable for cold weather and in my country it gets up to 40 degrees Celsius in summer. Then I saw the ultralight mask which is suitable for hot enviroments but it does not filter exhaust fumes and organic vapour. So my question is if there is any way of mixing them for example can i buy the ultralight mask and use CINQRO filters or can you suggest another mask for me or something? I have provided two options for you to choose from, however you can use any mask with any filter or any valve system so ultimately you can build a mask to your specification. The best configuration for activities in hot climate would be the Respro® Ultralight mask (air permeable mask cover shell). They both combine comfort, breathability and submicron particulate filtration with the most efficient valves for evacuating heat, water vapour and Carbon Dioxide at elevated breathing rates. The stock filter (same as fitted on the Cinqro mask) is a Hepa-type filter, perfect for sub-micron particulates, dust pollen etc. For winter activities we would be recommending that you buy a Cinqro or Sportsta mask. They are the best masks for winter sport activity combining face protection from cold temperatures with the best airflow characteristics and one that I use for around town use when I bike around London. Using piece of cotton or string, measure the circumference around the neck. use a ruler to determine the length of string. This is the neck circumference. Thanks a lot for the information! Very usefull! Either mask can be used for pollen filtration The primary difference is the valves. The Ultralight™ Mask would be used more for active sports. Where can I buy the Cinqro Mask in Delhi? or from our website respro.com We offer free shipping worldwide. We like to buy Ultralight masks, we are Europeans. I cycle in London every day but I fancy the ultralight mask so as it’s comfy, breathable and washable. 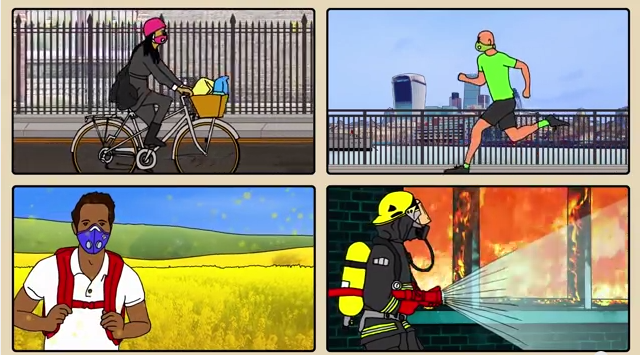 Would the filters be too weak for London pollution? The filter in the Ultralight™ is the sports filter which is excellent for (PM) particulate matter but does not have any filtration ability against gases and vapours associated with the likes of exhaust from cars buses and lorries. For that we would suggest the Ultralight™ combo, it comes with a pack of Cinqro™ urban filters which is purpose built for polluted urban environments. Hi, can I use Cinqro Urban Filter with a Techno mask? Yes, you can use a Cinqro™ filter in a techno Mask. Just make sure to buy the same size as your mask. Hi, I work in a steel manufacturing plant. What would be best against fine steel dust? Currently using 3M N95 mask. Sounds like you need an occupational mask and should get in touch with a health and safety officer to do a risk assessment to determine what PPE would be suitable for the levels of dust and chemicals/materials your are being exposed to. This is something that we recommend to all occupational enquiries of this type. The respiratory protection you using at the moment is N95, you could also improve the spec by using an N99 rated mask. I hope this is of assistance and I look forward to hearing from your shortly. What is the technological difference between the Cinqro, the Techno and the FB-1 filters? What are their filtration capabilities and performance? My second query is: is the FB-1 filter is compatible with my Sportsta Mask? All filters and valves are interchangeable in all masks (except Metro) provided they are the same size, ie large filter for large mask. The Sportsta filter has sub-micron filtration capability (sports). What this means is that it is able to trap particles less than one micron in size which is more than capable of the removal of 2.5 micron particulate material (PM). Typically particulate pollution in the cities appears to be in the 2.5 micron size range and above. Particles smaller than this are known as respirable dusts, which can lodge deep within the lungs and air sacs. This is the more dangerous type of particle pollution as chemicals from vehicle exhaust gases combustion known to be toxic, are carried by means of the respirable particles. Hence the need for a Hepa-type submicron particle filter. The Techno filter has both sub-micron, gas and vapour filtration capability. What this means is that it has the same capability as the Sports filter’s particulate material plus a layer of DACC Activated charcoal layer. It has excellent adsorption properties when it comes to SO2 and NO2 uptakes. With submicron dust filtering capability and its capability of filtering VOC’s it is the best filter available in our range for dealing with the broad spectrum of pollutants commonly found in major cities across the globe. The City filter has gas and vapour filtration capability. It particulate filtration but not the same spec as the filter in the Sports filter. It has excellent adsorption properties when it comes to SO2 and NO2 uptakes. For submicron dust filtering capability it is best to choose either the Techno filter or the Sports filter. The filter fitted in the Cinqro has sub-micron filtration capability (same as sports) . What this means is that it is able to trap particles less than one micron in size which is more than capable of the removal of 2.5 micron particulate material (PM). 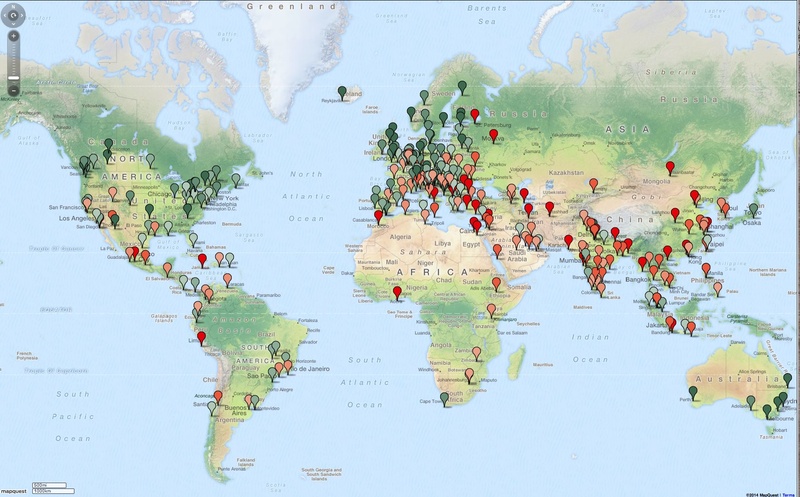 Typically particulate pollution in the cities appears to be in the 2.5 micron size range and above. Particles smaller than this are known as respirable dusts, which can lodge deep within the lungs and air sacs. This is the more dangerous type of particle pollution as chemicals from vehicle exhaust gases combustion known to be toxic, are carried by means of the respirable particles. Hence the need for a Hepa-type submicron particle filter. The second filter, in the packaging, is a combination filter the same specification as the Techno filter, but a different more user friendly construction (Respro® Allergy mask). The DACC Activated charcoal layer within this filter has excellent adsorption properties when it comes to SO2 and NO2 uptakes. With submicron dust filtering capability and its capability of filtering VOC’s it is the best filter available in our range for dealing with the broad spectrum of pollutants commonly found in major cities across the globe. The Allergy Particle filters out sub micron particulates. This includes particles such as dust and pollen, which normally are the cause of allergic reactions. This means that it can filter out smaller particles than PM 2.5 (Particulate Material). Particulates that are sub-micron are more dangerous due to their ability to transport themselves deep into the lung. The Allergy Chemical Particle filter is a combination filter. It combines a submicron particle layer with an activated charcoal layer (DACC). It has the ability to filter both Particulate matter and gaseous by products. This filter more suited to people who have MCS disorder. The FB-1 filter comes in two formats a Hepa-type filter (sports) and a Combination filter (urban). It comes with valves already fixed to the filter. any distributors of ResPro in Malaysia? Regrettably we do not have any dealers in Malaysia. For commuting in major cities, we recommend the Techno mask where pollution is high and full of diesel particulates. The Techno filter in the Techno mask is the Sports mask filter and the City mask filter combined giving the user both sub-micron particle filtration with gas and vapour filtration. The Techno filter has sub-micron filtration capability. What this means is that it is able to trap particles less than one micron in size which is more than capable of the removal of 2.5 micron particulate material (PM). The DACC Activated charcoal layer within the Techno filter has excellent adsorption properties when it comes to SO2 and NO2 uptakes. With this capability and its capability of filtering VOC’s it is the best filter available in our range for dealing with the broad spectrum of pollutants commonly found in major cities across the globe. You can order your products directly from our website and get free shipping anywhere in the world. We offer a fast, efficient, secure with next day despatch guaranteed whilst we have stock. I saw free shipping on the website. But Malaysia is not in the list. Can you ship to Malaysia? We do not have a supplier in Malaysia, but we certainly ship to Malaysia. Shipping is free anywhere on the planet so long as there is a regular postal service provided in that country, a bonafide address for the goods to be sent to and the order value is over £25.00. where can i purchase it in mumbai ? capable of the removal of 2.5 micron particulate material (PM). need for a Hepa-type submicron particle filter. Company: Gear The Bike Shop India Pvt Ltd.
day despatch guaranteed whilst we have stock. From your dimensions we would recommend a medium size mask. Do you have mask for kids? Our concern in providing masks for children is that the size variation in children is so wide. that a “childs” mask will not fit the range of sizes that children come in. We suggest that alternative ‘common sense’ precautions ie hood on push chairs, keep away from large congested or dense traffic environments; if you cannot, then place something in front of their faces more like a guard to prevent air/wind/ polluted air from direct contact. The ‘small’ mask is the smallest size available. This would ordinarily cover very small adults and older children. Children’s breathing rates are considerably lower that that of a walking adult so they should not be in too much danger if exposed to pollution for irregular periods of time. In general, common sense practice should be applied where at all possible. Can Sportsa mask use the filters from Cinqro??? or are all the various type of filters interchangeable among the mask??? You would require size L.
The City™, Sportsta™ and Techno™ masks all have interchangeable filters and valves to allow you to choose the best option of mask and filter dependent on your needs. I understand that the filters in these three are interchangeable, however Ernest and I have the same question, is it possible to install a Cinqro filter in a City mask? Sportsta for Ernest. 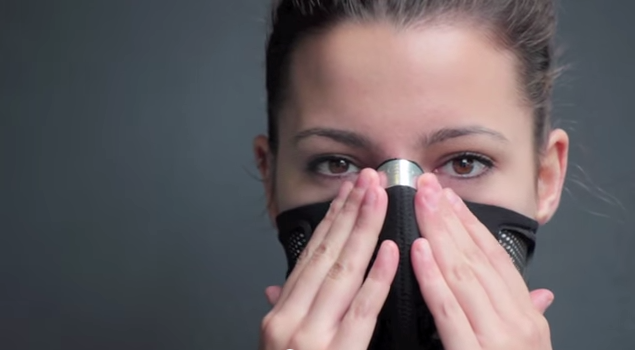 You can install a Cinqro™ filter in a City™ or Sportsta™ mask provided they are the same size. ie Large filter large mask. What is the best mask/filter combination that protects against pm 2.5 and yet is suitable for intense outdoor physical activity in all weather conditions? Thank you. For your activity we would be recommending that you buy a Sportsta™ mask and change the filter to a Techno filter. This is the best combination mask for sport activity in the city environment It will have the best airflow characteristics combined with the best filtration. I use this combination for around town use when I bike around London. It does not impair cardio function and may even assist especially with the cold snaps that we have been having. The only time I had to remove the mask was climbing a hill off road in the snow and my heart rate was topping 160bpm. By that time I was in an anaerobic state so I know its good for 160 bpm without having to remove it for one or other reason. 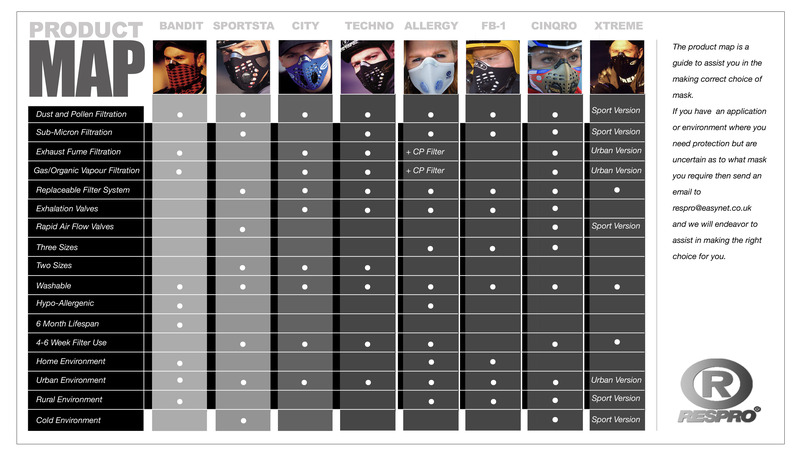 However you can buy the Techno filter at a later date once you have got used to wearing the Sportsta™ mask. It has the best valves that readily dump heat, water vapor, and CO2 which you don’t need or want when inhaling.